A bookmark is a marker, which is used to keep the reader’s place in a book and to enable the reader to return to it easily. The material may be just a piece of paper, card, leather, or fabric. However, with the advent of the latest technology and Internet, now web pages can also be bookmarked. This not only helps us to return to our marked site or page but also saves our search time. Believe me creating a bookmark is very simple, in other words just a click is needed to create a bookmark. On the top right of the browser, click the Star. The star will turn blue and a bookmark for the page, you’re currently viewing will be created. If you want to create a bookmark for all the open tabs, right-click on any of the tabs and select Bookmark All Tabs, from the context menu. 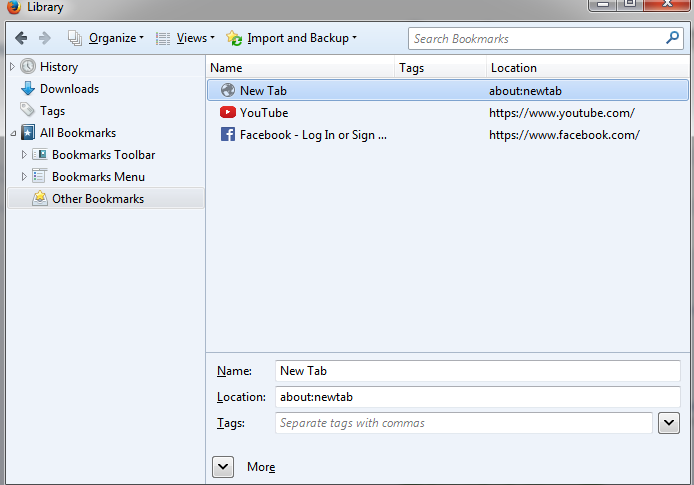 Now provide a name to the new bookmarks folder along with the folder location to save it. Click Add Bookmarks to complete the task. Once a bookmark is created, you can any time edit the details, like the name folder and tags. Folder: You have the choice of selecting the folder from the drop-down menu. Tags: You can use tags to help you search through and organize your bookmarks. Click the Done button, to save the changes made. Enter the bookmark name in the address bar. As you continue typing, a list of web pages with a similar name will start appearing. The pages, you have bookmarked, will have a star next to them. Now, select the page you require and click on it. Next, to Star, there is a library window button > click. 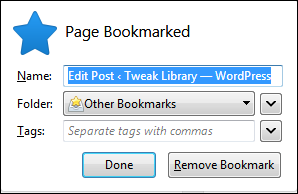 Here, you have two options – View Bookmarks Sidebar and Show All Bookmarks. The bookmarks, you have made, are in the Other Bookmarks folder. Select Show All Bookmarks to see the bookmarks you’ve made. Double-clicking a bookmark will open it. Opened library window will let you move bookmarks into other folders. For example, Bookmarks Menu folder will display the bookmarks in the menu under the Bookmarks button. 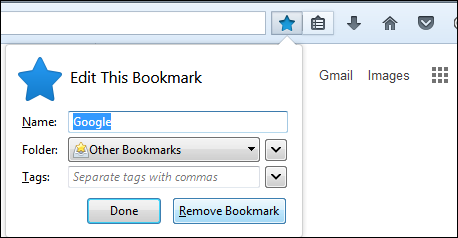 However, if you have added bookmarks to the Bookmarks Toolbar folder, then they will be displayed in the Bookmarks Toolbar. Click the three horizontal lines menu button at the top right corner of the browser and select the option > Customize. In the bottom-left corner of the window that opens, click the Show / Hide Toolbars dropdown menu and select Bookmarks Toolbar. Click the Exit Customize button to exit from that window. Shared bookmarks on social sites have become a means for users sharing similar interests to pool web resources. They can store their bookmarks in such a way that they are not tied to one specific computer or browser. Also, web-based bookmarking services let the user save bookmarks on a remote web server that are accessible from anywhere. So the bottom line is that bookmarks help you to come back to the same place you had earlier left and saves your valuable time.